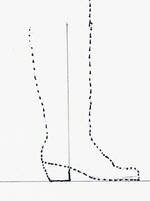 Draw an outline of each foot. Use reverse side of this paper. Sit in a chair and wear your socks. Hold your pen straight up and down. First, make a mark at toe and heel. Then draw all around your foot. Measure: Your tape measure makes a circle around foot and around leg. Measure over socks. Pants worn in boots? Sketch your boot over the boot outline. Show buckles, straps, zippers, studs, inlays details. Are buckles and zippers or studs brass___ nickel___ black___other___? Describe the overall look and feel of your boots: hard___ soft___loose, tight, rustic, refined. You may attach or email me a picture of the boot you want. But snail mail the order form and foot drawings.